There are plenty of reasons why doctors shouldn’t get sick. The best one being – we make the worst patients. I, of course, am no exception. Despite having had plenty of practice in the past of being a patient, somehow, I just don’t seem to learn. Every time I get sick, I am always a doctor, trying to be a patient. So why are we such bad patients? Because we think we know better. We are the one saving lives, and sometimes we refuse to admit that we are the ones that need saving. 6 weeks ago, I caught a viral infection, not hard when you work with sick people all the time. I kept working, because as far as I was concerned, if I wasn’t intubated on a ventilator in intensive care, or in a casket, I was not sick enough to stop working. Reason #1: We don’t realise how crap we really feel until we stop worrying about how crap everyone else feels. When you are deeply buried amongst blood and gore during an operation, you concentrate on what’s in front of you, rather than the tightness and clogging in your own lungs. Two weeks later, instead of improving, I developed a hacking cough which sounded like I was trying to expel my lungs in piecemeal. As I was struggling for breath whilst talking to patients in my clinic, one of my colleagues suggested that I go and have a chest x-ray done. I did. I looked at it with my colleagues (bear in mind we are both plastic surgeons who rarely ever have to look at chest x-rays), we decided that my lungs looked normal, that I would live and carry on. However, just to be on the safe side, I texted a photo of my x-ray to my husband, who is a lung surgeon, and looks at chest x-rays every day. Reason #2: For every doctor who self-diagnoses, there is an idiot patient. I received a text from the husband. Go and see a real doctor. I shrugged it off, he was obviously happy to look at everyone else’s x-rays, but couldn’t spare two minutes looking at his own wife’s x-ray. Reason #3: Sympathy is sparse when you are married to a fellow medico (and surrounded by friends who are doctors). You have to be showing signs of multi-organ failure before you get breakfast in bed. I carried on with my afternoon operating list, during which, couple of times I had to sit down because I felt light headed from being short of breath. I felt tired, and was taking more care than normal, but the list went on smoothly without a hitch. Reason #4: It takes a sledgehammer to slow down a surgeon. Because we are so focused on our work, we often don’t realise we are pushing our bodies to the limit until we collapse in a heap. Reason #5: When we self-diagnose, we either completely miss the obvious, or become total hypochondriacs with the worst over-diagnoses. In my case, it was the former. 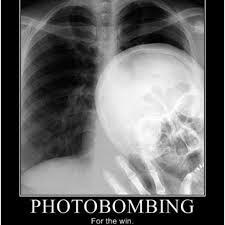 Also, note to self- I obviously am not qualified to read a chest x-ray. I climbed into bed in my work clothes. I couldn’t think of anything more mortifying than going into hospital for a cold and cough. There was no way I was going into hospital for this. So exhausted was I that I fell asleep within 10 seconds. Reason #6: We never think we are sick enough to seek medical attention. The next day, as I was doing an early morning ward round, I ran into a friend/colleague who is a general physician. He took one look at me, frowned at the sound of my wheezing and coughing, and promptly declared that I needed to be admitted to hospital for treatment. I told him that I had a full clinic, and will have to check into hospital later that evening. He suggested that I get myself into hospital as soon as possible; I told him that I couldn’t cancel all my appointments and let my patients down at such short notice. Reason #7: We think that the Earth would stop spinning without us, and that our patients couldn’t possibly survive without us. The day was particularly long – like a train in slow motion. Several patients looked at me in concern and told me I didn’t look well. I asked my secretary to shift all my appointments and operating lists for the next few days, so I could be admitted into the hospital. Some patients were angry and upset, some complained that they are busy people and already had arrangements in place for their booked surgery. Apparently my illness was going to interfere with their plans. Some were worried that their treatment were delayed and felt that I was neglecting them. Reason #8: Some of our patients think they couldn’t possibly survive without us. So I checked myself into hospital that evening. I was put on oxygen, given nebulisers, antibiotics and tucked into bed to rest. It was only when I was forced to do nothing that I suddenly realised how terrible I felt. My chest felt tight, my ribs ached, and my body gave in to the continuous coughing that rattled my bones. My limbs were like jelly and my muscles barely contracted, behaving like useless slabs of soft meat patties. I couldn’t sleep as the call bells pealed throughout the night, sounds of doors opening and closing interrupted my light slumber, and occasional moans and yells from other patients made me toss and turn. The next morning, the physiotherapist spent half an hour bashing on my chest to clear up the clogging in my lungs. We then decided to venture out of the room for a walk, and that is when I saw one of my own patients walking down the corridor on her zimmer frame with her physiotherapist. I looked down at my pyjamas in shame and high-tailed it back into my room. I started thinking about leaving the hospital. Reason #9: Even though as doctors, we spend the majority of our lives in a hospital, we actually really hate staying in one. When my physician came to see me, I spoke to him about the possibility of having my treatment at home. He was able to adjust my antibiotics and decided that I could be discharged as a ‘hospital-in-the-home’ patient, where I will be going home with my IV cannula in place, and just come back to day hospital for my IV antibiotics, physio and nebulisers once a day. Reason #10: A colleague will always assume that as doctors, we would be trust-worthy, compliant, sensible patients. WRONG. As soon as I arrived at home, I headed to the study and switched on my laptop. I reviewed all my dictation and letters, chased up lab results of my patients and caught up on some bookkeeping for my practice. The day after I was discharged, I had a case which could not be cancelled, so I asked my anaesthetic colleague to remove my IV cannula so that I could scrub for surgery, then to replace it after surgery before I headed back into hospital for my treatment. Reason #11: We know how the system works and we have connections. Doctors will always find a way to circumvent treatment regimes to suit their activities. But as I sat there at the end of the day, with the IV antibiotics dripping into my veins, and the nebuliser oxygen mask on my face, I suddenly felt so tired. So tired of it all, of putting on a brave face, of carrying on as if nothing is wrong when I felt so unwell, of worrying about my patients when I should be concerned for my own health, and most of all, I was just simply tired. My bones ached from exhaustion, and my mind was so worn out, it was completely devoid of any emotions. Mentally, I was waving a white flag. My body was shutting down because it had reached its limits, and it was time I surrendered to the consequences. Reason #12: It is terrifying for doctors to admit that we, despite our abilities to help people and save lives, are just like everyone else, mere mortals, in bodies that have limits. After four frustrating, agonising weeks, I am finally on the slow road to recovery. It is only now that I have started to contemplate changes in my life, ways of improving my health, and strategies of looking after myself. In a moment of déjà vu, I felt that I may have been down this path before. Regardless, I was, at last, being a sensible patient. That is, until next time. OMG. I am soooo glad you survived!!!! I have been worried about you. I did similar crap last year. It started with an agonizingly painful case of hand foot and mouth, caught from my lovely children. As I was pseudo-recuperating, still working, I developed strep which then progressed to pneumonia. Still working. I was luckier than you. Physicians should never get sick. We are stupid, stupid patients. See, Victo Dolore? I told you she wasn’t in prison for running a white slavery ring. She was just sick. Welcome back SAT. Victo’s imagination gets away from her sometimes. Sigh. I WAS IN PRISON!!!! That’s how I thought of my time in hospital. My crime was self-neglect and living on chocolates and coffee instead of ‘proper food’ – whatever that is! Chocolate and coffee. Yep, Momma D gives it to you straight: ’twas your crime. I agree with your hard-earned conclusions. Time for a reassessment and adjustment on a number of things so that YOU take care of YOUrself. I’ve been considering a post…on how we’re all dispensable. PS – haven’t heard back on the invite. Chk your Spam if you didn’t see it in your inbox. Thanks! I will definitely try harder…. It’s time for me to learn to be more selfish!!!! I’m glad you’re fine now. I’ve missed you on here. But you do make a terrible patient! Next time listen to your body and take the advice you’d give to your patients! But it is amazing how far focusing on something else can take you. I drove myself to hospital whilst in labour. It was fine until I’d hit a red light at which point I’d be doubled over in pain. As soon as it changed to green though I was off again, too busy concentrating to feel it. Welcome back. Hope you are feeling better now. Oh that sounds soooooo good…. Glad you finally got yourself taken care of. I can relate a little bit to this post – my Mom was a nurse and is also a terrible patient. She hates hospitals. Yep! Doctors and nurses are notoriously non compliant!!!! I would know cos my mother was a nurse too and she is even worse than me! I’ve missed you!! Glad to hear you are finally taking the time to heal. Awww. Hugs. Thank you and yes I will definitely try to be kinder to myself this time round. It’s going onto my list of new year resolutions for 2015! Pedestal? No no no no! We definitely need to be taken down a notch or two from time to time! Anyway, you can talk! You nurses can be terrible patients too! Glad to hear that you’re on the mend. I’m a Physician Assistant in the U.S. and your illness reminds me of the time that I had a severe attack of bronchitis and didn’t want to leave work, so I had the nurses hook me up to IV antibiotics and I saw patients the rest of the day, and left when the IV was finished and continued with oral antibiotics. I’m sure that the patients thought that I was crazy, and yes, I probably was- but it’s true. Doctors, PA’s, RNs and other medical staff DO make the worst patients. You had me almost screaming at my screen “just go to the DAMN hospital already!! Stop being so bloody stubborn!!”. ha ha. Glad you eventually got there, even if it was reluctantly. I can relate to some extent – as a chef, I never call in sick unless I am on my death bed, or clearly have something that I need to stay away from food or others. There is a sort of macho code (stupid) with many of us. Lost an arm? Pit olives with the other one. But compared to you doctors, we are wusses…lol. But I get your point, and can see why you all can be so difficult as patients…ha ha. As usual, a great, great read and another glimpse into the psyche of the surgeon. Even if I want to yell at my screen. You were missed – glad you’re back and on the mend. Hello my friend! I have missed you. I am so looking forward to catching up on your posts in the next few days. IAnd Yeah, I deserve all the yelling you want to send my way! Is there a groups for workaholic anonymous?!? Maybe I qualify to be the founder of such a group :-D! I think the year of 2015 will consist of a few changes….. Thank you Peace. I am finding out that it’s kinda nice to be selfish and put myself first from time to time! Thanks QP. I am learning to be selfish and feeling guilty cos I am liking it a bit too much…. And it may even become a habit!!!! 😀 I am making changes, only small ones but hopefully by January they will accumulate to a significant change in my working schedule. Yay! You really need to take a break doc. Just deciding to do so, is the hardest part. The actual “break” ain’t so hard. Hope you recover soon. And hope to see a flurry of post-recovery blog posts. My stalker #3 was called Mr Mycoplasma 🙂 but no fear, I am back!!!!! Whoa. I’m so glad you’re getting better! Loved reading your post, you make good sense. One of the reasons I’m a terrible patient is because I work in a public hospital but I am a private patient – and private hospitals/doctors don’t have the financial constraints we do in public. Yeah. I’m not their favorite patient. Hahaha. You should just learn to be the patient and let someone else do the doctoring!!!! At least I didn’t tell my physician what antibiotics to prescribe! What do you think of patients who ask for souvenirs? I really, really wanted to keep my appendix and the bone chips that came out of my knee but tyrannical doctors and nurses stymied me at every turn. I mean, come on, those are disgusting, wonderful parts of my own malfunctioning body and I want to horrify house guests with them. Granted, the video I got of my knee surgery sort of made of for some of the oppression. Hahahahahaha. Well, the appendix would have had to go to pathology for examining as part of medicolegal requirement in case there was a tumour in it. The bone chips, I would have not give to a patient as it is sharp and can be hazardous. There was a case where a patient received some wires that was removed from his jaw from his surgeon. Anyway, when he opened the jar, he accidentally dropped it and caught it with his hand. The wire pierced his hand and damaged a nerve. He ended up with chronic nerve pain in his hand and sued the surgeon for giving him the wires. As a policy, we are not allowed to give patients anything that is removed from their body including their own body parts!! !